I'm still trying to figure out a way to get good photos through the microscope. 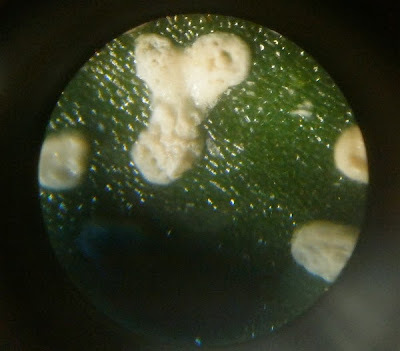 It may well be the case that no such way exists with the current microscope and camera, in which case I'm wasting my time trying, but for now, I have not yet decided that it's hopeless. Part of the problem is that I lack for subject matter that I think you guys would find interesting. I could get plenty of pictures of scale insects, I suppose, but for the most part, anything I can see with the microscope is what I see with my naked eye, but bigger, which means my camera can get pictures reasonably well already. Pollen is an exception. I can't tell much about pollen aside from its color with my naked eye, and sometimes I can't even determine that, but the microscope magnifies it just enough to see shapes. 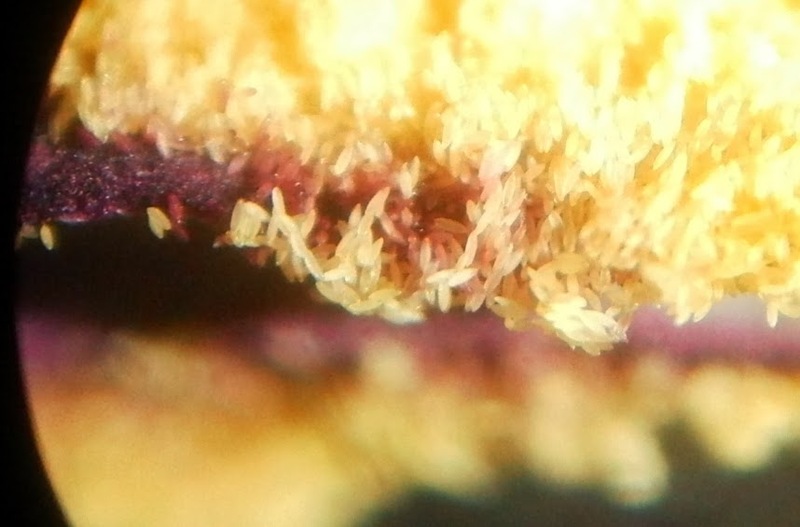 Hippeastrum pollen happens to look just like yellow rice. And there is so much of it, too. Though I didn't try to get a picture of that. I did try to self-pollinate the Hippeastrum, but it didn't work. The petals and sepals dried up, and the base of the flower swelled like it's supposed to, all as expected, but after about a month, the whole flower stalk turned yellow and mushy, then flopped over. Oh well. It was trying to save me from myself, no doubt. The microscope has also proven itself useful a number of times during suspected bug infestations. 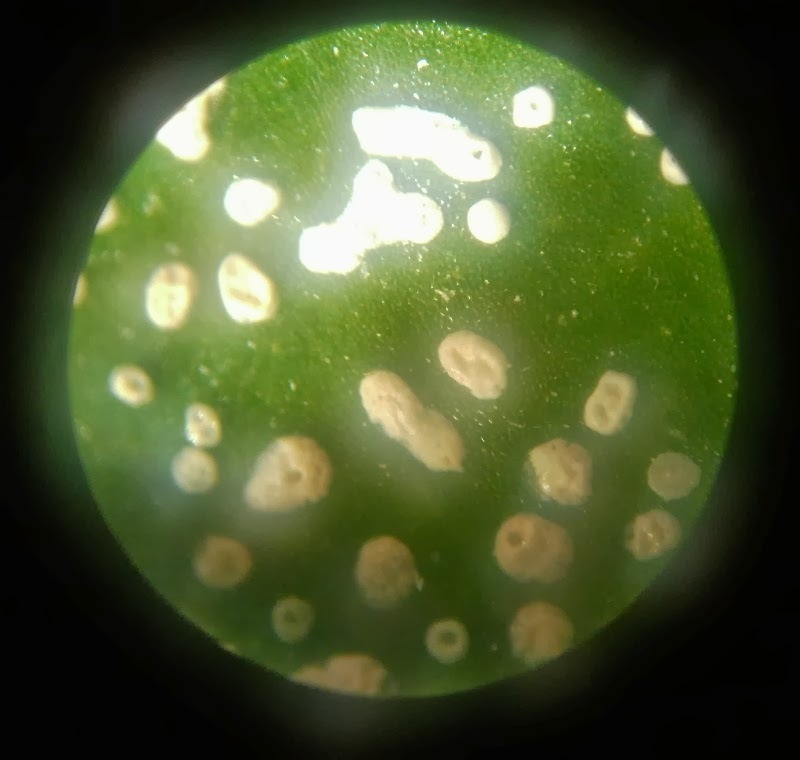 My Anthurium schlechtendahlii, in the husband's office, was getting a thorough inspection a while back because I'd found scale on a plant on a shelf above it, and I saw this weird white stuff. The texture made me think of spittlebugs. Spittlebugs indoors would be unusual, but ever since the caterpillars, I don't rule anything out. On the other hand, spittlebugs produce a lot more froth, the froth would be easy to move around on the leaf, and spittlebugs wouldn't put the froth out in the middle of a leaf: they're pickier about location than that. So it was a mystery for a while. But then the husband noted that the contractors had been in his office a couple months before, and had sprayed various substances in there, so it was probably (his theory) spray-on wall texture stuff. (Would it have been beyond our capabilities to cover the plant shelf with plastic before stuff got sprayed in there? No it was not. But we didn't do it.) So unless the A. schlechtendahlii is suddenly covered in some new kind of bug in the near future, I'm assuming that this is contractor-related, case closed. 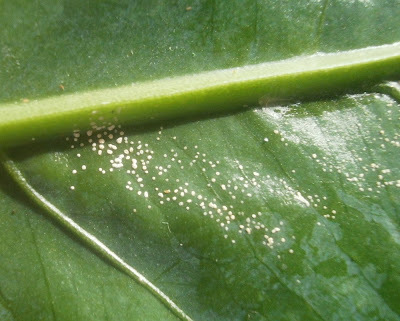 Still haven't made any determinations as to the identity of the mysterious Aglaonema mites. I did wipe them off the affected plants with rubbing alcohol and a paper towel, after that post, and they've stayed off of some plants but not others. (Which is what I expected: I didn't think one time would be enough to get rid of them.) So I don't know what's going on, and possibly never will. 1) I've just felt really run down lately, as happens from time to time, and then Daylight Saving Time had to happen and screw everything up even more. When I invent my time machine, first thing I do is go back and kill George Vernon Hudson. Entomologists are always ruining everything. 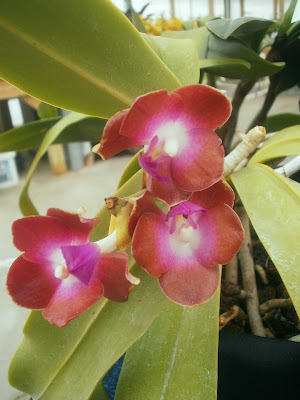 2) The orchid show is this coming weekend (15-16 March) and I'm trying to water stuff faster than usual so I can be ready for that. It's not really working so far, because of the tiredness, but the intent is there. This is also going to keep posts slow for a while, since sorting and scheduling the orchid pictures is always at least a week's work. 4) New Anthuriums produce buds almost every week,1 and it's getting harder and harder to keep up with who's doing what when, so I'm trying to set up some notebooks so I can keep track of each one individually. And then I decided to make the project more complicated, because . . . I always decide to make everything more complicated. So it looks like that's going to take a long time to sort out. But posts will return eventually, I promise. Wes Coast (#273) -- light pink? Jujubee (#280) -- light pink? Chad Michaels (#5) -- dark red? Mason Pepperspray (#202) -- ivory, so maybe eventually light pink? I don't know if there wasn't a tag, or if I just missed getting a picture of it. But in any event, I don't know what this is. Looks sort of Phalaenopsisish to me, but the photo's not great, and those are some mighty big roots, for a Phalaenopsis, so I am prepared to believe pretty much any ID anybody wants to offer.